The outdoor infinity pool that overlooks the Arabian Sea was the biggest attraction when the JW Marriott opened at Juhu, Mumbai, in 2004. That was Marriott's fourth property in India, and the biggest turning point for the hospitality chain, nearly five years after entering the country. Now, the Marriott alone has 36 hotels across seven brands - Courtyard, JW Marriott, Renaissance Hotels, Ritz-Carlton, Fairfield Inn & Suites, Marriott Hotels and Resorts - spread over 19 Indian cities. With Marriott International acquiring Starwood Hotels & Resorts Worldwide in a $13-billion deal last September, Marriott has emerged as the largest hotel company globally and in India. It now has a portfolio of 1.1 million rooms across 5,700 hotels in 110 countries. 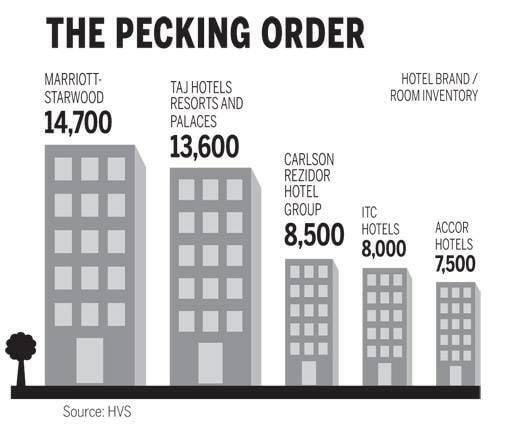 In India, it has 14,700 rooms across 83 hotels, ahead of Taj Hotel Resorts & Palaces (13,600) and Carlson Rezidor (8,500). Starwood with the ITC partnership has 47 properties, including 28 franchised hotels. Post the acquisition, Marriott International has 30 hotel brands that now also include Sheraton, Westin and St. Regis. Fifteen of the 30 brands are already present in India and Marriott has a robust pipeline of 100-odd hotels. The group is expected to add 15-20 new hotels a year and is expected to touch the 200-hotels mark over the next five years. Marriott's quick rise to the top has unsettled large domestic hotel chains such as the Taj group, East India Hotels (Oberoi Hotels), Leela Palaces, Hotels and Resorts and ITC Hotels. In the annual report for 2015/16, P.R.S. Oberoi, Executive Chairman of luxury chain EIH, stated: "The recent merger of Starwood with Marriott would undoubtedly have an impact on rates and rebalance occupancy levels in highly consolidated markets." Marriott is known to charge higher fees than its competitors in India. While the base fee for most US and European brands ranges between 2-2.5 per cent of the top line, Marriott would charge 2.5-2.75 per cent. Over a 20-year contract period, it makes a difference of several crores. A hotel owner says the chain always has higher fees than others, and they could possibly charge even more in the future. "Marriott is always known to be an expensive brand because they safeguard their interests first. You cannot blame them," he says. 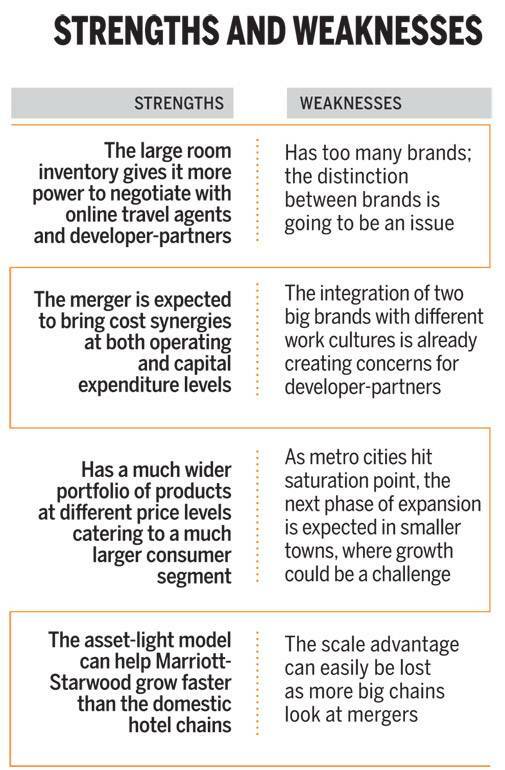 Now that the Marriott brand has been established, focus would be on the franchisee model. Navjit Ahluwalia, Senior Vice President, Hotel Development (South Asia), Marriott International, says that the chain has opted for the franchise route to grow in India. Marriott, like many other global hotel chains in India, follows the managed model where they run hotels, owned by developers, in return of an annual fee. The hotel owners approve annual budgets, and Marriott manages everything - day-to-day operations, bookings and marketing. "We have always said that we want to establish our brands first, and once the brand identity is established, then we are open to a franchise model. Over the next 10 years, our franchise business will be bigger than the managed business," he says. For Marriott, the Starwood acquisition was not an option but a compulsion. Marriott expects to drive top line sales because it has inventory strength, best industry talent and with scale, it should be able to bring cost efficiencies. Buying out Starwood was not easy for Marriott. It had to fiercely compete with the Chinese Anbang Insurance Group. The acquisition is expected to bring in economies of scale. But the key reason behind the Starwood buyout is a murky fight between hotel operators and online travel aggregators (OTAs), that is changing the way the hospitality industry operates. 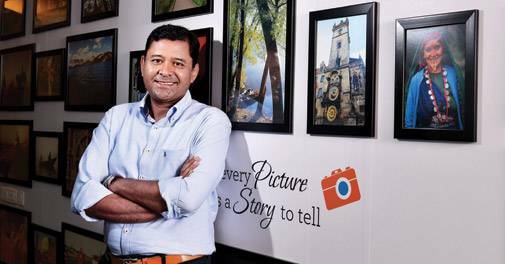 Backed by large funding, OTAs such as Expedia and Booking on a global level, and MakeMyTrip, Yatra and Cleartrip in India are giving hotel chains a run for their money. (See Fighting the OTAs). Add to that, the challenge is posed by Airbnb. Neeraj Govil, Area Vice President (South Asia), Marriott International, says that cost savings will be in hotel development and operations. Global vendors for Marriott International include personal care company Kimberly-Clark, Pepsi, Accenture, and Oracle. Then, there are local contracts for LPG cylinders, vegetables, poultry, diesel, among others, where they should be able to bargain with vendors. It has the ability to do volume purchases for twice the number of hotels. "There are a lot of [saving] opportunities we see," says Govil. If Marriott's scale brings cost synergies, will it benefit customers and hotel owners? "We have a better chance to sell our products at a better price. 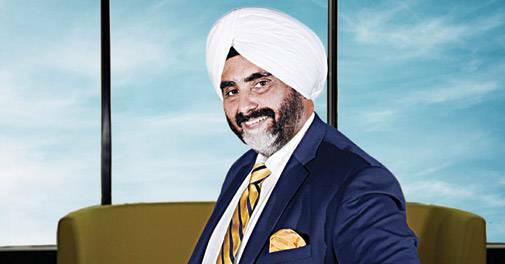 We can be more competitive in the market," says Ahluwalia. "I haven't been given any indication that base fees, incentive fees, or sales and marketing contribution are going to come down, which means that they are not passing the benefits of merger to owners. There was an opportunity to make themselves more attractive to owners, but clearly they want to retain all the profits to themselves," says Ashish Jakhanwala, Founder and CEO, SAMHI, a private equity-controlled hospitality firm, which owns 18 hotels under the Starwood, Marriott, Hyatt and Accor brands. 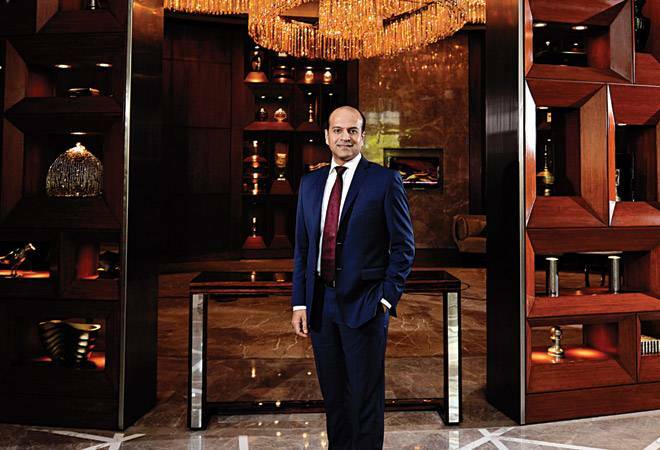 Harpal Singh Saggu, owner of JW Marriott in Chandigarh, says that it's been so far so good. "We have fixed agreement with Marriott, which cannot be changed in the middle," he says. The Starwood acquisition also means that it can tap into the Starwood Preferred Guest (SPG) loyalty programme. Post the acquisition, Marriott linked its Marriott Rewards programme with SPG. It, however, didn't collapse into one giant programme with 100 million members, because the structure of both programmes is different. The way points are earned and redeemed are not the same. For instance, points can be redeemed in SPG against experiences as against Marriott Rewards programme in which the points are redeemable against products only. The loyalty points are fungible at the moment, and programmes will be merged by the end of next year. Over the years, Marriott's ability to attract a select group of financially strong and locally entrenched hotel developers has helped a lot. Many of these developers - SAMHI, Panchshil Realty, K. Raheja Constructions, Brigade Hospitality - have multiple properties. Working with a small group of multi-unit owners ensures that Marriott can scale faster as it doesn't have to worry about managing relations with property owners - a tricky thing in India. In total, Marriott has about 60 developers. In India, the fresh supply of rooms will be largely skewed towards the mid-market segment. Marriott's new construction is also focused on this segment with brands such as Fairfield by Marriott, Courtyard by Marriott and Four Points by Sheraton. In some ways, Marriott is in a sweet spot because of its well diversified portfolio, straddling from luxury space to distinctive mid-market brands. It is difficult for competition to match its portfolio. Ultimately, the brand reputation is built by luxury hotels such as St. Regis and Ritz Carlton, which have a rub-off effect on mid-market brands for aspirational travellers. Mandeep Lamba, Managing Director (India), Hotels & Hospitality Group, Jones Lang LaSalle Property Consultants, a realty consultancy, says that the market will ultimately have three-four key players. "Size and geographical spread provides major distribution efficiencies and enhances brand offerings by more brands covering various market segments and ensures that there is an opportunity to flag all types of hotel developments." A deal of the Marriott Starwood kind has no parallel. The scale involves significant complexities across several areas, but not limited to different cultures and working styles of the two organisations. The integration of two entities will be something to watch out for. Marriott is disciplined and process-oriented, while Starwood was an innovative organisation. From the historical perspective, Marriott was able to survive and thrive because it could maintain a certain traditional approach while innovating at the same time. Starwood was new on the block. The company was founded in 1980 by Barry Sternlicht. Its core strength was innovation. Marriott's brand architecture, especially around brands such as Ritz Carlton, JW Marriott, is fairly regimented, which means that it follows a more prototypical and disciplined approach to the product. For instance, all Fairfield by Marriott properties have the same pattern of wood on the back of the reception desk. They have the same colour of upholstery on the furniture. Starwood was far more innovative in design. Starwood's Sheraton brand typically has different characters in different cities. The Maurya Sheraton in Delhi, Sheraton in Bangalore and Sheraton in Hyderabad have high degree of individuality. Customers recognise them for their individual identities, and not necessarily for their architectural consistency. "There are times when I want flexibility. If I have bought an existing hotel, and want to convert it, I want more flexibility. We have bought a lot of local hotels and converted them. We want to see if Marriott will preserve that innovative culture of Starwood or will that disappear and, therefore, we have one less option," says SAMHI's Jakhanwala.